To the west of the Minneapolis Chain of Lakes resides Saint Louis Park, a first tier suburb filled with community and life. Having a rich history that’s closely associated with Minneapolis, St Louis Park was a village whose growth was formed, like much of the Twin Cities, with industrial development brought on by the railway systems that zig zagged through the area. 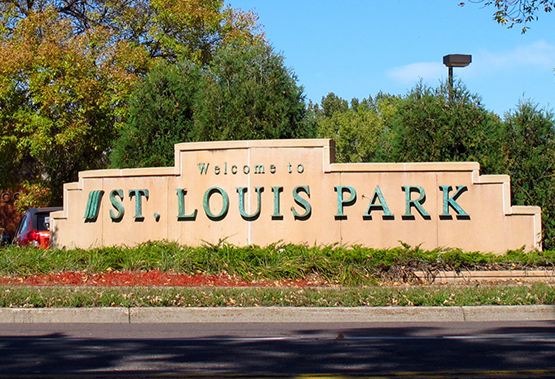 Present day St Louis Park has a median age of thirty four years old and is dominated by first time home buyers and growing families, where job opportunities at over 2,700 businesses in the community flourish and accessibility to the entire metro is easily achieved. With borders of Interstate 394 to the North, U.S Highway 169 to the West, Highway 100 to the East and Highway 7 crossing through the city, convenience to local shopping, Downtown Minneapolis, the Chain of Lakes or even additional suburbs is easy and accessible. If you prefer to leave your car and explore by bike or foot, there are excellent trails that run east to Minneapolis and its lakes, or as far West as Chaska. With the mission statement, “Deliver responsive municipal services to ensure a safe, welcoming and vital community now and in the future”, you can anticipate a community that’s welcoming and offers opportunity to its residents. Ask us about St Louis Park’s incentives to new residents to make the city their home. Beautifully Maintained Twin Home With Excellent Updates. Newer Front Paver Patio, And Newer Driveway. Lower Level Professionally Finished In 2006. Maintenance Free Exterior. Prime Location Next To Birch Wood Park, And Minutes From Downtown.